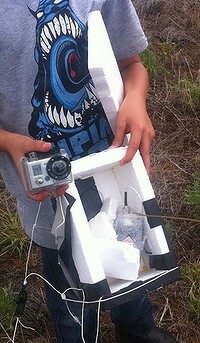 Sydney space enthusiast Robert Brand and his 9-year-old son Jason recently launched a high-tech weather balloon a quarter of the way to space, retrieving images and flight data to help school children get a better understanding about space. Mr Brand, of Dulwich Hill, has a history with space – at age 17 he wired up some of the Apollo 11 communications gear in Sydney during his term break from college. He was also stationed at the CSIRO Parkes Observatory in New South Wales at the request of the European Space Agency for spacecraft Giotto’s encounter with Halley’s comet in 1986 and Voyager’s encounter with Uranus and Neptune in 1986 and ’89. Also under his belt is an award from NASA for support of STS-1, the first orbital flight of the Space Shuttle program, presented personally by the commander and moon walker John Young. So when it came time for Mr Brand to launch his own gear towards space he was well prepared, documenting his do-it-yourself journey on his personal blog wotzup.com for other space enthusiasts to watch and track. “[The balloon launch] was being done to help science education in the Sydney area and anywhere else in fact because we were publishing [on the internet] all of the information and data that we got from the balloon launch,” said Mr Brand, 59. Launch day was December 28, 2011 from Rankins Springs near Goolgowi in Central NSW. As the balloon got up to about 85,000 feet (25.9 kilometres) above Earth before it burst, Mr Brand and his son tracked it using amateur radio. The data being sent back from the balloon – which was later recovered about 50 kilometres away from where it was launched – tracked altitude, position, rate of climb, payload temperature, payload voltage and air pressure, Mr Brand said. The balloon also has a camera on board that captured still images. “We could actually see as [the balloon] hit different wind levels in the atmosphere and eventually we got up into a jet stream and actually found that we had two jet streams,” Mr Brand added. When the balloon finally popped it came hurtling back towards Earth at about 40 metres per second, according to flight data. “So this thing was falling a bit like a brick would fall at ground level but it slowed down and eventually the parachute dropped it on the ground at about six metres per second,” Mr Brand said. The photos that came back from maximum altitude look “pretty much like that taken from a space shuttle”, Mr Brand said. After knocking on a farm door to no avail, he and his son entered the field to locate the balloon. After driving “pretty much right on top of it” it was recovered, allowing for the father and son duo to publish the photos it captured that weren’t sent back live but stored on the camera attached to the balloon. Mr Brand hopes to do more balloon launches and get schools involved.